It’s usually a slur against Christians whose heads are “in the clouds” all the time, too focused on heavenly matters to be of any help for the practical side of life. The idea is that if you spend too much time looking to the future, you’ll miss out on making a real difference in the present. If you read history you will find that the Christians who did most for the present world were just those who thought most of the next. . . . It is since Christians have largely ceased to think of the other world that they have become so ineffective in this one. To put it another way: having your mind set on heaven is the prerequisite for a Christian’s doing good on earth. The title of my next book is Eschatological Discipleship. Now, I realize these two words rarely sit next to each other. 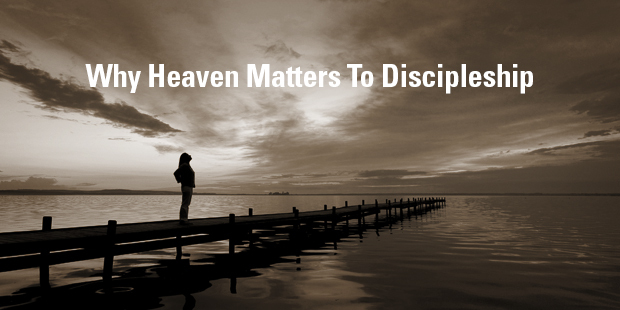 Most people think of “discipleship” as a set of spiritual disciplines that bring about Christian growth. And most people think of “eschatology” as a fancy word describing the end times (and all the debates about how and when Jesus will return). Discipleship is something practical. Eschatology? Well, that’s speculation we can put at the back of a systematic theology textbook. Discipleship is about feet on the ground right now, and eschatology is about what will happen when Jesus returns on the clouds. Right? When we see discipleship as something ahistorical (something that never changes no matter the context or time period), we tend to adopt personal practices of piety but fail to train ourselves to become good missionaries by seeing and embracing our role in a particular context. When we see eschatology as something primarily futuristic (about how Jesus will return or about what happens to us personally when we die), we tend to engage in theological speculation but fail to learn how to interpret today’s world in light of the Bible’s big vision of world history. That’s why I’m pushing for a broader, more expansive understanding of eschatology. We can’t reduce eschatology to the details surrounding Christ’s second coming, or to events that take place as soon as we die. Eschatology is shorthand for the Bible’s great story. Yes, it involves the future—where the world is going—but this future is held together by the past event of Christ’s resurrection and the future event of his return. A broader vision of eschatology leads us to ask an important worldview question: “What time is it?” That question means: “What does obedience and faithfulness look like in this particular time?” Just as we are to work out what faithfulness looks like in a particular place, so also we must understand what shape faithful Christianity will take in a given time. We understand our times in light of God’s sovereign plan. When discipleship doesn’t take into consideration that worldview question “What time is it?” or when eschatology gets pushed off to the side as if it’s just about our personal future and not about the whole, great story of our world, then we have a much harder time reading the signs of our own times. We find it hard to navigate the darkness of our contemporary age. We can’t see how to meet current challenges in light of God’s coming kingdom. Is there biblical precedent in the Old or New Testaments for linking our obedience as Christ’s followers to eschatological realities? If so, where and how do these links occur? What is discipleship, and how does it relate to the mission of the church? How is our obedience motivated by eschatological reality? How do we contextualize our mission for the times in which we live? What role does worldview formation play in the making of disciples, and what role does eschatology play in worldview formation? How does our mission of proclaiming the gospel as the true story of the world interact with and confront rival eschatologies? How can we strengthen various conceptions of discipleship by giving more attention to their eschatological dimension? So, what is “eschatological discipleship”? It’s a type of spiritual formation and obedience that takes into account the contemporary setting in which one finds oneself, particularly in relation to rival conceptions of time and progress. That’s what I unpack in this book. I hope it starts a good conversation about the practical way we can accomplish the subtitle: “Leading Christians to Understand Their Historical and Cultural Context.” It’s time we counter the prevailing rival eschatologies of our current cultural moment and display our unique identity as kingdom citizens. If you’d like to preorder the book, it’s available at LifeWay, Amazon, Barnes and Noble, Books a Million, and ChristianBook.com.